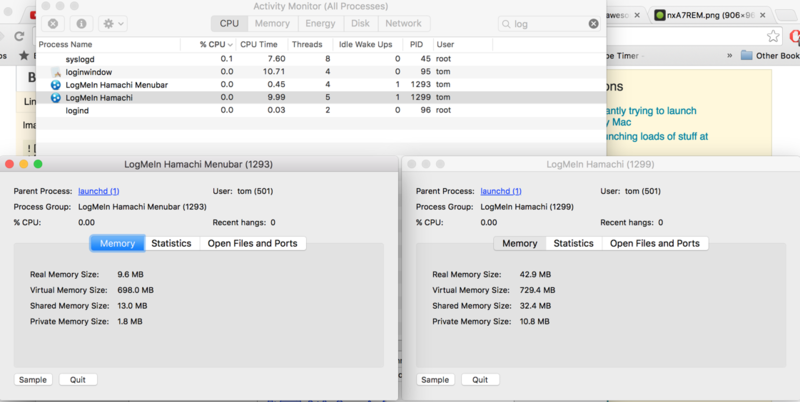 I simply cannot find a way to stop LogMeIn Hamachi loading at launch. I use it rarely but don't want to un-install it yet it bugs me that it's there. The parent process (launchd, process ID 1) is the second process started by the machine (after kernel_task, ID 0). It loads up launch agents (that run at login for each user) and launch daemons (that run at boot for the whole system). What you need to disable or delete is the launch agent corresponding to LogMeIn Hamachi. It’s in the folder /Library/LaunchAgents/. You can go to the folder in the Finder by using the menu item Go > Go to Folder, and pasting in the path. If you delete the file com.logmein.hamachimb.plist in the LaunchAgents folder, then log out/reboot, you’ll find that LogMeIn Hamachi won’t load when you log in anymore. Not the answer you're looking for? Browse other questions tagged macos mac boot logmein or ask your own question. Why does LogMeIn not display all objects correctly? Is it possible to use Logmein to connect to a sleeping (Mac) computer on a wireless network?